Robert Kirkman has famously mentioned that he created The Walking Dead as if it was a never-ending Zombie movie. Originally created as a graphic novel, The Walking Dead has become a pop-culture phenomenon and the highest-rated program on television, but the dark memories of Rick Grimes and his gang of survivors are oftentimes more horrific than facing down a mega herd of walkers. At the half-way point for Season 6, an unusual story-telling trend is developing: The TV show’s creators are employing flashbacks on an increasing basis, but only getting lukewarm results. Our Suggestion: No More Flashbacks! For six seasons now, The Walking Dead has employed three different showrunners, a ton of different writers, producers and actors, along with the rest of the show’s crew. Change has been a constant for the show, but so far, no two episodes have really been alike. There have been good episodes, bad episodes and average episodes that have aired during that time, but the use of flashbacks has never really been an issue until recent seasons. In fact, there’s many similarities between the comic series and the television show, but the use of flashbacks seems to be a big difference. Never really appearing in the printed format, flashbacks have really been more prominent for Season 6 and that is a bad thing. As a MacGuffin, a flashback can be a plot device used to help to move the storyline forward. Generally, a MacGuffin requires little to no explanation, whatsoever and is typically unimportant to the overall plot. However, the flashbacks of TWD Universe tend to give backstories and try to explain the character’s current-day motivation, often influencing future stories. In theory, flashbacks can actually help out present-day storylines, but that’s not always the case with The Walking Dead. While the Shane-Lori flashback was meaningful and important, flashbacks generally feel like a cliche for lazy storytelling. Used too many times, flashbacks can take the audience away the current-day storyline, losing its effect and relevance. LOST famously used the technique to move its storyline backward, forward and sideways, sometimes multiple times per episode. In fact, LOST was better known for using this technique, than for its convoluted storyline, which took away from the show’s overall experience. That is the actual danger that The Walking Dead now faces. Show, not tell, is generally widely accepted as the best storytelling approach for a visual medium and sparingly used, a flashback is fine. But when Bob, Abraham, Enid, The Governor, Michonne and even Gareth (really?) all get flashbacks, it becomes an overused gimmick that lessens the importance of Morgan’s flashback. I must admit, the Season 6 episode, Here’s Not Here, may be one of the Top 5 episodes of this entire series. 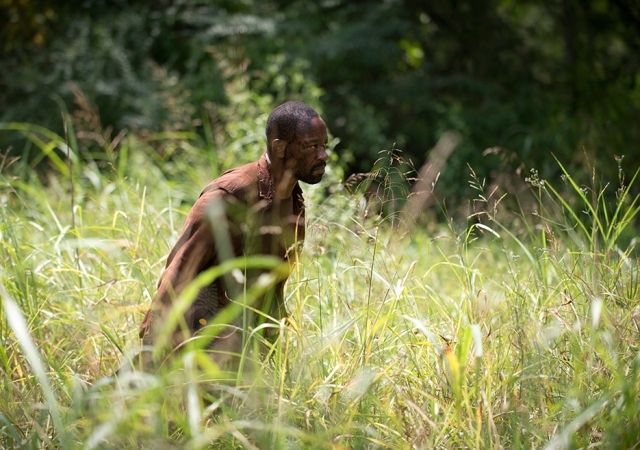 The opus of Morgan Jones, where he transforms from a walker-killing wild man to relearning to become a human once more was incredibly powerful. Mad Morgan became a pacifist, which was a radical change for the character… one which deserved depicting. The 90-minute episode felt a little drawn out, but it added a layer of complexity for the character and the overall universe that is much needed. Sadly, the episode aired immediately after Glenn’s cliffhanger, creating incredibly bad timing for this change-of-pace storyline. The fate of Glenn (which felt like a cheap trick) was extended longer than than the audience deserved, with the placement of this episode. Here’s Not Here could have easily been depicted chronologically and had the same effect. Morgan’s story was great, but the tool that was used to tell the tale felt like it was more important than the actual storyline, taking away the power and momentum of the past few present-day episodes. Flashbacks feel like a cheesy cop-outs that ultimately slow the urgency of current story. Former Showrunner Glen Mazzara previously mentioned the technique, “takes him out of the story,” but he’s no longer running the show, so maybe that was once an issue with Creator Robert Kirkman. Clearly he’s the man in charge of this pop-culture powerhouse and most likely the technique will be used once more, in future episodes. Some of the aforementioned flashbacks don’t really have any sort of influence or outcome on the current storyline, making them unremarkable time fillers. Maybe they would be better used as Webisodes, only offered online, but not in long-form 60-minute TV episodes. Even during the Zombie Apocalypse, the future seems bright for The Walking Dead. Now, if only the production crew would only focus on moving forward instead of backward with the timeline, an incredible storyline could be told!